This chapter is about getting images into GIMP. It explains how to create new images, how to load images from files, how to scan them and how to make screenshots. But first we want to introduce you to the general structure of images in GIMP. It is tempting to think of an image as something that corresponds with a single display window, or to a single file such as a JPEG file. In reality, however, a GIMP image is a a complicated structure, containing a stack of layers plus several other types of objects: a selection mask, a set of channels, a set of paths, an "undo" history, etc. In this section we take a detailed look at the components of a GIMP image, and the things that you can do with them. In a grayscale image, each point is represented by a brightness value, ranging from 0 (black) to 255 (white), with intermediate values representing different levels of gray. 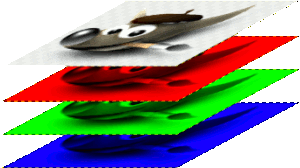 In the RGB Color Model, mixing Red, Green and Blue gives White, which is what happens on your screen. 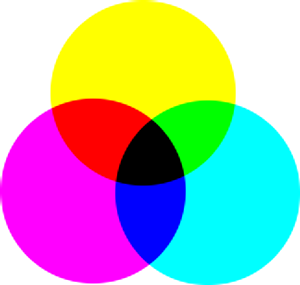 In the CMY(K) color model, mixing Cyan, Magenta and Yellow gives Black, which is what happens when you print on a white paper. The printer will actually use the black cartridge for economical reasons and better color rendering. Conceptually, the difference between a grayscale image and an RGB image is the number of “color channels”: a grayscale image has one; an RGB image has three. 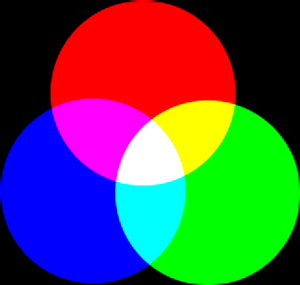 An RGB image can be thought of as three superimposed grayscale images, one colored red, one green, and one blue. Actually, both RGB and grayscale images have one additional color channel called the alpha channel, which represents opacity. When the alpha value at a given location in a given layer is zero, the layer is completely transparent (you can see through it), and the color at that location is determined by what lies underneath. When alpha is maximal (255), the layer is opaque (you cannot see through it), and the color is determined by the color of the layer. Intermediate alpha values correspond to varying degrees of transparency / opacity: the color at the location is a proportional mixture of color from the layer and color from underneath. An image in RGB mode, with the channels corresponding to Red, Green and Blue. An image in Grayscale mode, with the channel corresponding to Luminosity. In GIMP, every color channel, including the alpha channel, has a range of possible values from 0 to 255; in computing terminology, a depth of 8 bits. Some digital cameras can produce image files with a depth of 16 bits per color channel. GIMP cannot load such a file without losing resolution. In most cases the effects are too subtle to be detected by the human eye, but in some cases, mainly where there are large areas with slowly varying color gradients, the difference may be perceptible. The Alpha channel shows the image area which is transparent. A color image in RGB mode with an Alpha channel. GIMP makes it easy to convert from one image type to another, using the Mode command in the Image menu. Some types of conversions, of course (RGB to grayscale or indexed, for example) lose information that cannot be regained by converting back in the other direction. If you are trying to use a filter on an image, and it appears grayed out in the menu, usually the cause is that the image (or, more specifically, the layer) you are working on is the wrong type. Many filters can't be used on indexed images. Some can be used only on RGB images, or only on grayscale images. Some also require the presence or absence of an alpha channel. Usually the fix is to convert the image to a different type, most commonly RGB.